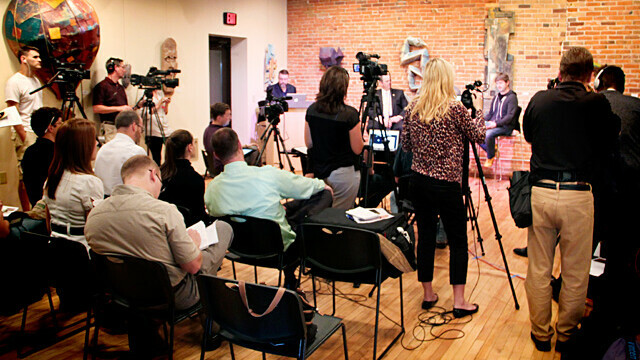 Thursday's press conference at the Volume One Gallery (Sept. 19). The proposed Confluence Project is more than an arts venue, Grammy winner Justin Vernon believes: It’s a foundation upon which to build a newer, more creative, and more vibrant Eau Claire for future generations. “Basically we need a completely new platform, and that platform can be taken care of and created in a really powerful way to last decades and decades and decades,” Vernon said at a press conference Thursday touting the proposed public-private performing arts center in downtown Eau Claire. 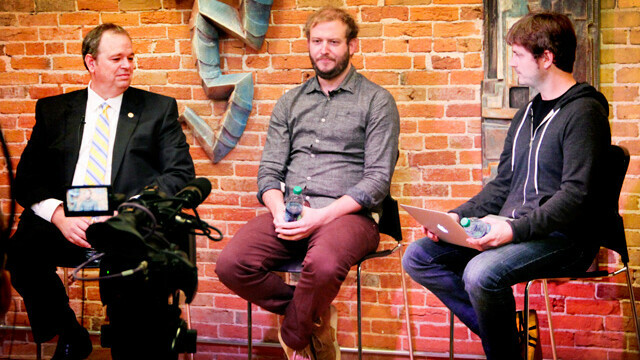 Vernon, an Eau Claire native and frontmanfor indie rock band Bon Iver, was joined by UW-Eau Claire Chancellor James Schmidt and JAMF Software founder Zach Halmstad at a media event in the Volume One Gallery. The roughly $80 million Confluence Project – which would include, among other things, three theaters, student housing, and commercial space – has symbolic and practical potential for Eau Claire, advocates said. The facility could be an iconic representation of the city as well as an anchor for creativity and business development, Vernon said. Vernon and Halmstad announced they will co-chair a philanthropy committee to support the project, a joint undertaking of UWEC, the Eau Claire Regional Arts Council, and Commonweal Development. While Halmstad’s firm has pledged $500,000 toward the project and Vernon said he expects to make a donation as well, the musician said the pair are probably more helpful using their notoriety to boost fundraising: “People for whatever weird reason know who we are,” he said. JAMF recently broke ground for a new office in downtown Eau Claire, and plans to expand from about 100 to between 200 and 300 employees here in the next three to five years. While some critics of the Confluence Project have worried that it will be a drain on tax dollars – the city and county will be asked to cover some of its construction and operational costs – Halmstad said taxes aren’t the most important factor in economic development. Schmidt, who took office as UWEC chancellor this summer, said the Confluence Project was a new model for the university-community relationship, both financially and creatively. “I imagine the university coming out of the ivory tower and working with artists, creating synergy,” Schmidt said. Retaining and attracting human capital is key for rural cities such as Eau Claire to survive in the 21st century, and the Confluence Project can help do that, he added. “These two gentlemen are case in point of why this project is so important,” Schmidt said of UWEC grads Vernon and Halmstad. Participants in the press conference also addressed concerns that a block full of old buildings – including 6 S. Barstow St., which is on the National Register of Historic Places – would be torn down to make way for the Confluence Project. Halmstad noted that before plans for the project were unveiled last year, both his company and Vernon looked at restoring the so-called “mural building” at 2 S. Barstow St. However, they and other developers determined they couldn’t rehabilitate the vacant structure in an economically feasible way, Halmstad said. “When the cost is too high to preserve history, I think you have to create some new history,” Vernon added. Confluence advocates said that the project is needed in part because both university facilities and the 87-year-old State Theatre have outlived their useful lives. Vernon said the Chippewa Valley lacks adequate facilities for many acts, including his: Trying to deal with acoustic problems before a pair of 2011 concerts at UWEC’s Zorn Arena drove Bon Iver’s sound man to tears, he explained. And the problem isn’t just with major venues, he said: Smaller clubs lack adequate PA systems, and there’s a shortage of all-ages venues. Vernon noted that musicians don’t necessarily want to travel 200 days of the year, so if the Confluence Center becomes a reality, “We’d be playing (in Eau Claire) a lot more than we are now,” he said of his musical endeavors, which also include the bands Shouting Matches, Gayngs, and Volcano Choir, the latter of which is in the midst of a tour. He even hinted that a new multi-theater venue could influence his own musical path: “I’d be creating new project based on the spaces available,” he said.